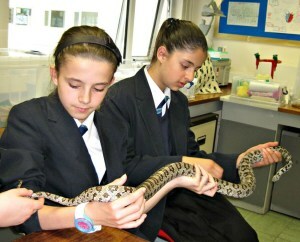 ALL creatures great and small came into Haslingden High School with a visit from Zoo2U. Lead science technician Claire Dawes arranged for the visit as a reward for 20 members of her after school animal club. The school already has stick insects, gerbils, a tarantula, a corn snake and fish, which the students look after and learn about in the club, which is held every week. Mrs Dawes said: “The Zoo2U people brought in a meerkat, an owl, two corn snakes, a chameleon, an iguana, a tortoise and a Madagasgan tenrec; a type of hedgehog that looks like a duckling but has sharp spikes with barbs on them. “Each different animal was introduced to the students and they were able to learn about it and ask questions. A couple of students fed the chameleon and the meerkat. “It was a really nice reward for the hard work of the animal club members and I hope to have the Zoo2U back in school again each year.